Researchers at the Grizzly and Wolf Discovery Center have an unusual grizzly problem on their hands. Manufacturers of bear proof containers and storage units in the Greater Yellowstone Region rely on the Center’s bears to test their products. Going ahead, that might not be the case. The reason? Plain and simple: the bears are bored. It might be a stretch to say the bears have gone on strike, but in this instance you can’t really blame them. A “bear proof” container is designed to thwart even the smartest, most patient bear for at least an hour—the gold standard of the industry. According to the Record, the Center’s “testers” have ravaged 425 containers over the past ten years, with three out of five lasting that golden hour. The reason for so many containers? Outfitters want a product that combines durability with portability: less strain for backpackers, more for bears. So they send them in for the bear test. On the other hand, Brian and Jane Robertson of Cody, Wyoming, have seen bears ignore their Robertson Enterprises front-country containers at the testing center. That proof of concept has helped spur a steady increase in demand for containers in campgrounds, recreation areas and picnic grounds. 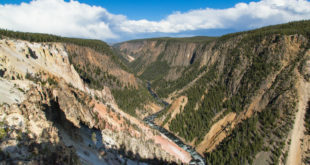 Jackson said the nonprofit GYC has agreed to match up to $125,000 one-to-one with the Forest Service to install new bear-resistant containers around Yellowstone National Park. The Greater Yellowstone Ecosystem holds an estimated 714 grizzly bears and a considerably larger number of black bears. Jackson said because the captive grizzlies have given up on those heavy-duty, permanent containers, the IGBC testing system has moved to a more lab-style testing standard in which welds and latches must survive mechanical stress tests equal to the force biologists know bears can exert. Storage units like trash cans and dumpsters, as well as portable containers, being bear proof in Yellowstone matters immensely, for both humans and bears. It helps insure the other against a (possibly) unfortunate encounter.